To Cite: Naderi M N, Funk L, Shokouh H. Bilateral Midshaft Clavicular Fracture with Unilateral Acromioclavicular Dislocation: A Case Report, Trauma Mon. 2018 ; 23(5):e57811. doi: 10.5812/traumamon.57811. Introduction: Bilateral clavicular fracture is a rare finding in which the injury usually involves the compression of both shoulders. Case Presentation: We report a rare case of bilateral midshaft clavicular fracture, accompanied by unilateral acromioclavicular (AC) dislocation. AC dislocation was reduced by open reduction and fixed with 2 pins. Both clavicular fractures were fixed with titanium elastic nails (TENs) and inserted from the sternal end with good cosmetic and functional results. Conclusions: This case report is a rare case of a bilateral midshaft clavicular fracture, accompanied by unilateral AC joint dislocation. Although a clavicle fracture is a common finding accounting for 2.6% of all fractures and 44% of shoulder girdle injuries (1), bilateral injuries are uncommon, and there are no reports of bilateral midshaft clavicular fractures, accompanied by acromioclavicular (AC) dislocation in the literature. Herein, we report a rare case of bilateral middle-third clavicular fracture, accompanied by unilateral AC dislocation, given its rarity and unusual mechanism. A 26-year-old female was the rear-seat passenger in a car accident. She was holding her baby at the time of the accident and thrown forward, injuring both her shoulders on the back of the front seat. On admission, swelling above both clavicles and asymmetry on one side was reported; however, there was no abrasion or wound. In addition, the patient had no symptoms of neurovascular compromise. Radiological examination revealed bilateral clavicular fractures and a Rockwood grade-V AC dislocation on the right side. There was also a nondisplaced intra articular glenoid fracture on the right side (Figure 1). 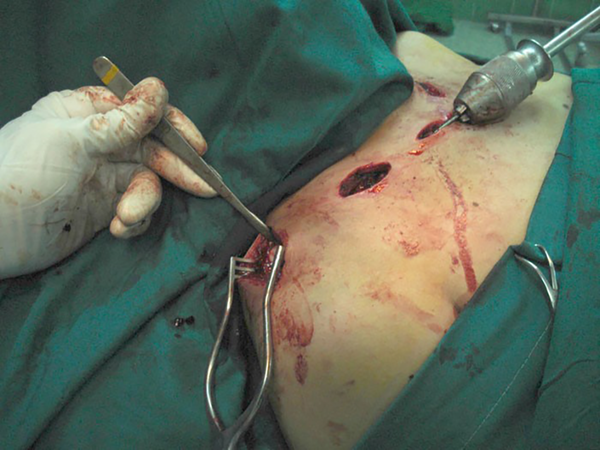 Minimal incision and intramedullary fixation of both clavicles were performed with intramedullary titanium elastic nails (TENs) and inserted from the sternal end (2). The AC joint dislocation was reduced by open reduction and fixed with two pins (Figures 2 and 3). The patient wore a standard shoulder sling for four weeks, and then, active mobilization was applied to improve the overhead position. Both fractures showed improvements in the follow-up (Figures 4A and 4B). The AC pins were removed after 4 weeks while the TENs were removed after three months (Figures 5A and 5B). The patient returned to regular activities and was asymptomatic, showing a full range of motion in both shoulders one year postoperatively. 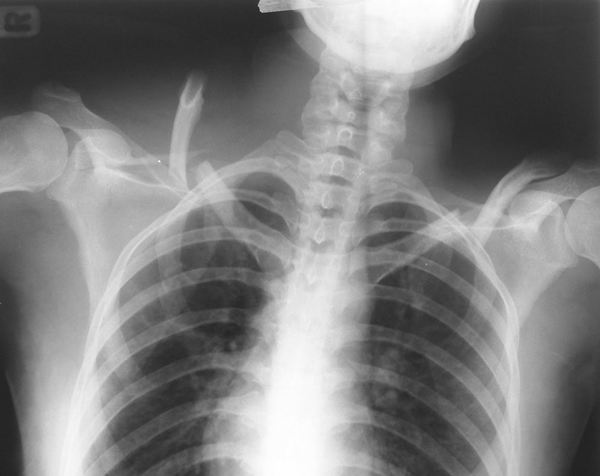 Although a clavicle fracture is a common finding, bilateral injury is uncommon. The likely mechanism of bilateral injuries is the compression of both shoulders (3). Likewise, the combination of a middle-third clavicular fracture and AC joint dislocation is rare. 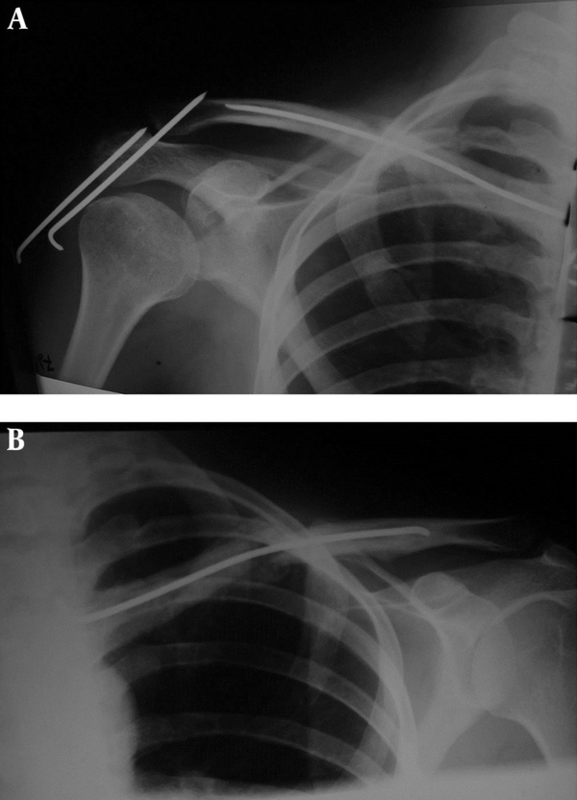 Juhn and Simonian (4) reported a case of type-6AC separation with middle-third clavicular fractures in an ice-hockey player who was treated with the closed method. Moreover, Wurtz et al. (5), reported four cases of unilateral middle-third fracture of the clavicle, combined with AC dislocation. They fixed the AC joint with screws or pins and applied closed treatment of clavicular fractures. Current management of AC joint dislocation (6) is inclined towards operative correction of type 4, 5, and 6 injuries (7, 8), while nonoperative treatment is initially preferred for type 1, 2, and 3 fractures. Although nonoperative treatment of clavicular fractures yields reasonable results (9, 10), in recent years, there has been a preference for operative fixation of displaced midshaft clavicular fractures (11-13). Rehm et al. (2), described fixation of claviclular fractures with TENs inserted from the sternal side. This technique was applied in 12 athlete patients with clavicular fractures and reported favorable results (14). Furthermore, Braunstein et al. 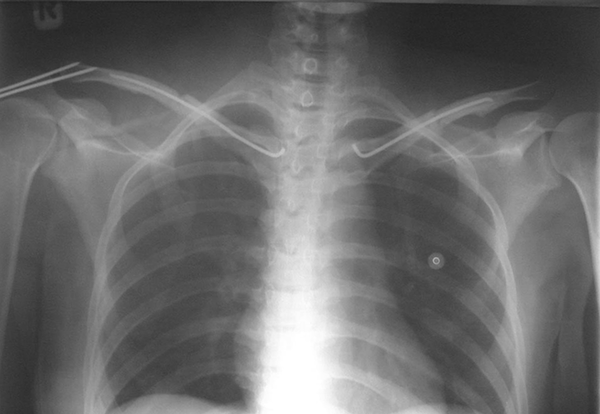 (15), reported a case of bilateral clavicular fracture. One side was managed nonoperatively, yielding unsatisfactory result, while the other side was fixed with intramedullary nailing with TENs, producing favorable results. This technique has been shown to be minimally invasive with good early pain relief. In the literature review, we could only find one case with this type of trauma, which was treated with open reduction and internal fixation by three plates (16). The reported case was a rare case due to the mechanism of fracture and pattern of injury. In addition to fixation of AC dislocation with pins, we fixed both clavicular fractures with percutaneous TENs, which resulted in minimal soft tissue damage and good cosmetic and functional results. 1. Postacchini F, Gumina S, De Santis P, Albo F. Epidemiology of clavicle fractures. J Shoulder Elbow Surg. 2002;11(5):452-6. [PubMed: 12378163]. 2. Rehm KE, Andermahr J, Jubel A. Intramedullary nailing of midclavicular fractures with an elastic titanium nail. Eur J Trauma. 2005;31(4):409-16. doi: 10.1007/s00068-005-6405-y. 3. Wilson MJ. 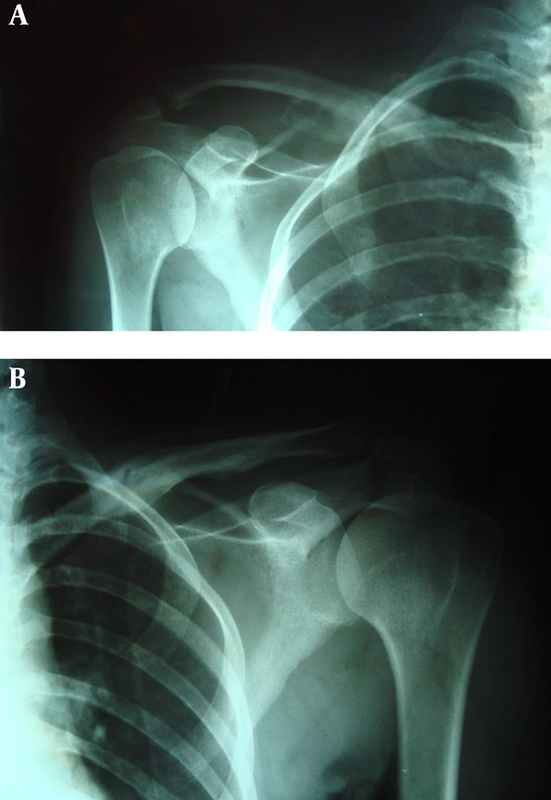 Bilateral fracture of the clavicle: report of an atypical case. J Bone Joint Surg Am. 1931;13(3):564-5. 4. Juhn MS, Simonian PT. Type VI acromioclavicular separation with middle-third clavicle fracture in an ice hockey player. Clin J Sport Med. 2002;12(5):315-7. [PubMed: 12394206]. 5. Wurtz LD, Lyons FA, Rockwood CA. Fracture of the middle third of the clavicle and dislocation of the acromioclavicular joint. A report of four cases. J Bone Joint Surg Am. 1992;74(1):133-7. [PubMed: 1734003]. 6. Rockwood CA. Injuries to the AC joint. In: Rockwood CA, Green DP, Wilkins KE, King RE, editors. Fractures in Adults. 1. 2ns ed. Philadelphia: JB Lippincott; 1984. p. 860-910. 7. Harris TG, Lynch SA. Acromioclavicular joint separations. Curr Opin Orthop. 2003;14(4):255-61. doi: 10.1097/00001433-200308000-00008. 8. Deitch JR. Acromioclavicular joint injuries. Curr Opin Orthop. 2004;15(4):261-6. doi: 10.1097/00001433-200408000-00012. 9. Nordqvist A, Petersson CJ, Redlund-Johnell I. Mid-clavicle fractures in adults: end result study after conservative treatment. J Orthop Trauma. 1998;12(8):572-6. [PubMed: 9840792]. 10. Stanley D, Norris SH. Recovery following fractures of the clavicle treated conservatively. Inj. 1988;19(3):162-4. doi: 10.1016/0020-1383(88)90006-x. 11. Hill JM, McGuire MH, Crosby LA. Closed treatment of displaced middle-third fractures of the clavicle gives poor results. J Bone Joint Surg Br. 1997;79(4):537-9. [PubMed: 9250733]. 12. Lazarides S, Zafiropoulos G. Conservative treatment of fractures at the middle third of the clavicle: the relevance of shortening and clinical outcome. J Shoulder Elbow Surg. 2006;15(2):191-4. doi: 10.1016/j.jse.2005.08.007. [PubMed: 16517363]. 13. Wiesel BB, Getz CL. Current concepts in clavicle fractures, malunions and non-unions. Curr Opin Orthop. 2006;17(4):325-30. doi: 10.1097/01.bco.0000233727.26139.cc. 14. Jubel A, Andemahr J, Bergmann H, Prokop A, Rehm KE. Elastic stable intramedullary nailing of midclavicular fractures in athletes. Br J Sports Med. 2003;37(6):480-3. discussion 484. [PubMed: 14665582]. [PubMed Central: PMC1724711]. 15. Braunstein V, Kirchhoff C, Buhmann S, Mutschler W, Biberthaler P. [Bilateral clavicular fractures occurring at different times. Conservative vs operative therapy using intramedullary nailing--a case report]. Orthopade. 2007;36(8):757-60. German. doi: 10.1007/s00132-007-1124-1. [PubMed: 17639338]. 16. Dong D, Yu M, Gu G. Simultaneous bilateral midshaft clavicle fractures with unilateral dislocation of the acromioclavicular joint: a case report. Med. 2017;96(21). doi: 10.1097/MD.0000000000006975. [PubMed: 28538398]. [PubMed Central: PMC5457878].